PASARELA FIJA FIXED GANGWAY Fabricada en aluminio anodizado plata y piso antideslizante. Se suministra con pasamanos y tintero. Ancho: 34 cms. Carga aprox: 120 kgs. Manufactured in aluminum alloy. Supplied with wheels and pivot pin. Width: 34 cms. Long./Length 2,00 mts. 2,50 mts. Peso/Weight 11 kgs. 13 kgs. Fabricada en aluminio anodizado plata y piso de aluminio antideslizante. Se suministra con pasamanos y tintero. Ancho: 28 cms. Manufactured in aluminum alloy. Supplied with handrail and pivot pin. Width: 28 cms. 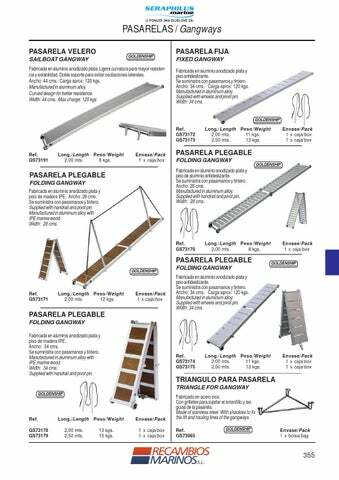 PASARELA PLEGABLE FOLDING GANGWAY Fabricada en aluminio anodizado plata y piso de madera IPE. Ancho: 28 cms. Se suministra con pasamanos y tintero. Supplied with handrail and pivot pin. 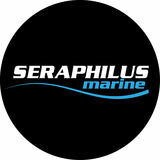 Manufactured in aluminum alloy with IPE marine wood. Width: 28 cms. FOLDING GANGWAY Fabricada en aluminio anodizado plata y piso antideslizante. Se suministra con pasamanos y tintero. Ancho: 34 cms. Carga aprox: 120 kgs. Manufactured in aluminum alloy. Supplied with wheels and pivot pin. Width: 34 cms. PASARELA PLEGABLE FOLDING GANGWAY Fabricada en aluminio anodizado plata y piso de madera IPE. Ancho: 34 cms. Se suministra con pasamanos y tintero. Manufactured in aluminum alloy with IPE marine wood. Width: 34 cms. Supplied with handrail and pivot pin. Peso/Weight 13 kgs. 15 kgs.